A large print introduction for Admissions can be found here. There are 25 steps down from the Foyer/Box Office to the Studio Bar, then 10 steps up from the Studio Bar to row A. However, you are welcome to use our lift and stair lift instead. Inside the auditorium, there are 2 to 3 steps between each row from row B to row R.
Between row A and E there are 10 steps. Between row A and L there are 28 steps. You can access row L from the Foyer/Box Office without entering the Studio Bar. 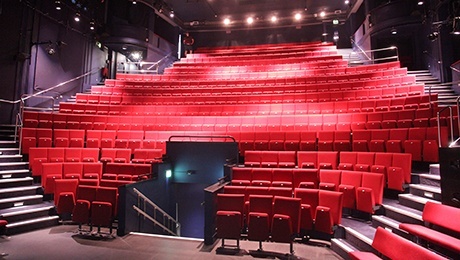 There are 14 steps up to row L and then again, 3 steps between each row to row R.
Both Trafalgar Studio 1 and Trafalgar Studio 2 are equipped with a Radio Hearing Enhancement System. Sound is amplified sound through headphones. Suitable for persons without a hearing aid. The headset also has an adjustable volume control. Trafalgar Studio 1 is also equipped with a Sennheiser MobileConnect WiFi sound amplification system. MobileConnect uses WiFi to deliver superior quality audio to a smart device such as an iPod or iPhone, either through headphones or via a necklace for hearing aid users. Devices can be booked via the box office in advance, borrowed on the day, or alternatively patrons can download the Sennheiser MobileConnect app and use their own device. 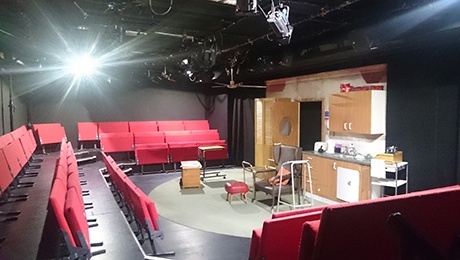 To pick your own seats for The Fishermen at Trafalgar Studios simply find the performances you'd like to see from the listings below and you'll be given the option.